Gender-based violence needs to end. This article was contributed by Leigh Stefanik, Gender-Based Violence Program Advisor, CARE USA. Pick your nose in a business meeting, and you’ll likely get swift, negative feedback. Likewise if you cut in line at a bank. Rules about nose-picking and queuing are clear social norms that help regulate daily social interactions. But social norms may also sanction extremely harmful practices, like gender-based violence, experienced by more than one in three women worldwide. In many communities it’s considered normal, for example, for a husband to beat his wife. Programs that seek to prevent gender-based violence can resort to the same system of social rules that keeps us from cutting in line. 1. Social norms are the unspoken rules of behavior considered acceptable in a group. They are determined by a) what I think others are doing, and b) what I believe others think I should do. I wait in line because everyone around me does, and because they think I should. If I skipped the line, I would expect others to scold me. Social norms are maintained by our expectations of others’ approval or disapproval. 2. When it comes to norm-setting, the people who influence us most are those in our “reference group” – people in our community, or those around us in a given situation. They can be people we look up to, e.g., peers, neighbors, trend-setters or parents. Norms are specific to different cultural and social contexts. 3. Social norms are more about our expectations about others than necessarily what they actually do and think – which we may misjudge. So we may be able to change individuals’ behaviors just by changing their perceptions of what others expect of them. 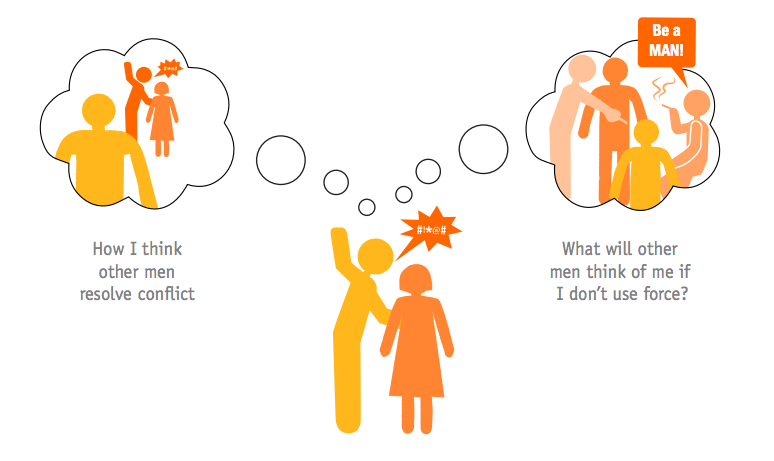 How can social norms help stop gender-based violence? Traditional interventions aimed at behavior change usually target an individual’s attitudes and knowledge. However, individuals’ behaviors may be more influenced by social norms. Someone whose attitudes about violence have changed may still use violence if there is a social norm to do so, due to fear of others’ disapproval (e.g., friends teasing him that he is controlled by his wife and not a “real” man). We need to focus on the role of social expectations in determining behaviors. This more nuanced approach has important implications for CARE’s work combating gender-based violence – including in two countries where we partner with Johnson & Johnson. In Sri Lanka, CARE works on seven tea plantations to address the social norm of men using aggression and violence against their wives. CARE and partners are developing a media campaign to stop harmful practices that entire communities perceive as normal and acceptable. In Ethiopia, CARE is working with whole communities and married adolescent girls to understand and shift harmful social norms around early marriage. These are just two examples of CARE’s growing understanding of how social expectations drive individual behavior. Social norms theory offers a promising approach to preventing gender-based violence worldwide. Presented by Johnson & Johnson, Major Partner of the 2016 Global Citizen Festival, and supporting partner of CARE.